I feel the rush of Fall here on The Mountain – it isn’t just the red and gold leaves strewn on the back lawn or the crisp, 68 degrees temperature; it’s the energy in my mind that tells me I have only a month left to finish writing a book of poetry before I leave for Louisiana where I spend the winter. The equation about books that I write is: I usually create at least one volume per season while sojourning in New Iberia, Louisiana, and one when I reside at Sewanee. This summer, I worked on two books, and the latest volume of poetry is forthcoming. It’s called RISING WATER, and some of the poems are those that have been sitting in a cardboard box for years. They were dusted off, revised, and put into book form. There’s also a travel piece in RISING WATER -- a series of vignettes written while we were traveling in North Carolina and that were published on my blog, “A Words Worth.” Again, a painting by my brother Paul adorns the cover of the book, and my grandson Martin has tweaked the design of front and back covers. Darrell Bourque, Poet Laureate of Louisiana, provided a wonderful blurb for the back cover, and Isabel Anders, a fellow author here at Sewanee, wrote another gracious endorsement. 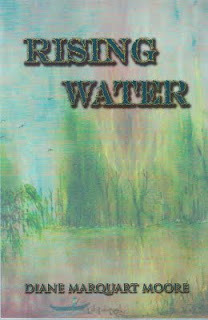 RISING WATER will be available at www.amazon.com in a few weeks, or you can order a copy from Border Press, P. O. Box 3124, Sewanee, TN 37375. In addition to my blog, “A Words Worth,” Border Press has a new site at http://borderpressbooks.com. safely hung behind the prepared altar. hoping they will release her from dementia. only about what we say to the brethren. in territory female and divine. P.S. I’m working on a collection of new poems and old short stories that have also been in a box for years. The book is called OLD RIDGES. Thank you for continuing to read and support my work. I shuddered when I heard Ahmadinejad’s defiant and unjust dismissal of the Holocaust as a fabrication of the Jews, and I wondered if the Israeli/Palestinian (and Iranian) conflict would cease in my lifetime. 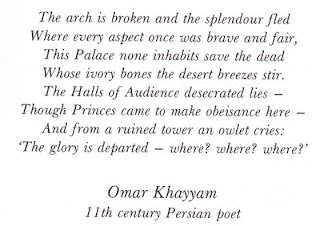 The poems I wrote in FARDA must seem sentimental in light of the present turbulence in the Mideast, but I am not a social or political commentator – I meant only to provide some enlightenment about the people and their history and how I felt about them when I lived among them, the poems conveying compassion, even a twinge of nostalgia for the country in which I spent two years. Three years earlier, I had read an article about the poet Naomi Nye in “The Progressive” magazine. Nye, of Palestinian origins, is fond of quoting Shirin Ebadi, Iran’s Nobel Peace Prize winner and human activist: “When countries are in conflict, political conflict, it is more important than ever to share culture, to share literature.” Nye’s response was that we should “read Rumi, Arabic poetry…a great Arab scholar, Dr. Salma Jayyusi, said: ‘if we read one another, we won’t kill one another.’” Her remarks prompted me to write FARDA. “To bend as we are directed to. To be requisite to the act. we are not worthy to be called human." My mother must have been slim and nimble-footed when she climbed up and down among the rocks and on the undulating trail through the dense forest of the Dismals Canyon back in the 20’s. When the sun came out on Friday, we drove to the Dismals to scout the trail she probably followed to her camp site during her famous camp-out in 1924 or 1925. The trail was only 1½ miles round trip, but it wasn’t an easy one to hike. We entered the Canyon and traversed a swinging bridge that caused my heart to accelerate wildly but I managed to wobble across, passing Rainbow Falls which has a pool at the top that was once used to baptize members of local churches in the early 1800’s. When we reached a grotto, I received strong vibes that my mother had been there. Later, I read that the small pool to the right of the grotto had been built by Girl Scouts in 1925, and they used it for drinking water. There’s no doubt in my mind that my mother had been among the girls who built this pool. A little further down the path, we came to the kitchen where a small fireplace had been built. “I bet Dorothy cooked here,” I told Vickie, my hiking companion. Again, I later learned that the Girl Scouts had built the fireplace in 1925, so my intuitions about Dorothy having been there were on the mark. From Dorothy’s description of spending the night in a sleeping bag under a ledge, I surmised that Temple Cave, a bluff shelter, was the site of the Girl Scouts’ bedroom. It had housed a tribe of Paleo Indians approximately 10,000 years ago, and pottery and arrow points have been found in the cave and in other areas of the Canyon. It looked habitable but Dorothy’s love of primitive camping is not part of my inheritance from her, and I kept visualizing snakes wriggling around under the ledge. We had no fish food with us but were told that if we had thrown fish food in the fishing hole we passed, it would have boiled up with bass, bream, perch, trout, and bottom feeders called “hog suckers.” However, the fifty degree temperature of the water limits their size, and, if caught, they wouldn’t make a good mess. (No fishing allowed, but I wonder if Dorothy and her gang wet their lines anyway). Although we often see giant hemlocks at Sewanee – one grows in our backyard – none of the Sewanee hemlocks can compare with the hemlock we saw in the Canyon. The tree is 138 ft. tall, 8ft. 9 in. around and has a crown spread of 50 ft. Alabamians brag that it’s the largest of its species in the world…they also claim that the forest in the Dismals has never been cut. At one point while hiking the trail, we looked up at a narrow opening between two large boulders that was the original entrance to the Canyon. No one is permitted to climb through the opening now, but I can visualize a small Girl Scout party attempting to do so, my mother in the lead. The Witches Canyon was a labyrinth of moss and fern-covered rocks where some strange creatures reside. They’re called the Dismalites, tiny gnats which, in their larval stage, look like glow worms. They put on a show that inspires night hikes for those who want to see the critters, but I didn’t linger after the first hike. Under the waterfall is a cavern where Aaron Burr hid for several months after killing Alexander Hamilton in the famous duel of 1804. Other outlaws who robbed and murdered travelers on the Devil’s Backbone (Natchez Trace) also hid in the cavern. Dorothy, who loved the color red, must have loved the brilliant cardinal flowers growing along a rushing stream, and many cardinal feathers were scattered along the Canyon path. I was perspiring freely and short of breath when we reached the end of the trail, but I have an even deeper respect for Dorothy’s stamina and for her love of the outdoors. She was a real Scout, and her appreciation of the pristine beauty of this unusual, unspoiled wilderness in northern Alabama was justified. I’m just sorry she never got back to the site. She’d have been near 100 years of age if she had lived to make the trek with me, but I know she would’ve probably been way ahead of me on the trail. I never could intuit the spot where she rolled down the canyon with her garter snake but it may have been at Temple Cave. I kept a sharp look-out for snakes but would’ve scuttled fast had I encountered one of the descendants of Dorothy’s garter snake! Note: The Discovery Channel filmed part of “When Dinosaurs Roamed America” in the Dismals Canyon. Director Sue Pilkilton, is a native of Tuscumbia who, as a teen-ager, was challenged to visit the Keller site and write about it as a tenth grade assignment for an extra 100 points. 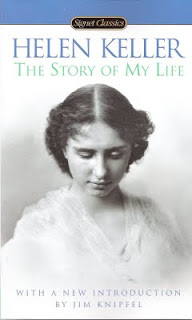 She fell in love with the home and the story of Helen Keller. After graduation from high school she went to work for the museum home and has remained there, ultimately becoming the director of the home and gardens. With grants and support from the City of Tuscumbia, she has created one of the South’s most attractive historic sites. I came away from Ivy Green thinking how much my eyes have allowed me to see in my lifetime – all those wonderful images and perceptions, colors and shapes…all the wonderful voices and music I’ve been able to hear. And Helen had only her fingertips and an indefatigable spirit to bring her the sights and sounds of the universe. A thunderstorm raged outside as we went through the TVA Museum of Art in Tuscumbia, a site that featured an exhibit of “The Era, Art, and Legacy of the WPA” as shown in silk screen posters, lithographs, woodcuts, dioramas, and cloth dolls. Also, photographs documented the work done by CCC’s on walkways and trails in Alabama. “Just like my father” (also deceased), I said to Vickie, my travel companion. “I came all the way to Alabama to see Dorothy’s primitive camp, and he’s again competing with her for attention with his WPA, CCC history, complete with thunder and lightning.” My father worked with both programs during Roosevelt’s New Deal, and every time I view some of this program’s handiwork, I remember how his work with the two programs inspired in him a love of rock and concrete… and how, with his oversight, my brother and I mixed volumes of concrete by hand to make benches, tables, and walks for the yard in Franklinton, Louisiana. In addition to the items displayed in the museum, the assistant director told us that several buildings on the University of Alabama campus were constructed by the WPA; in fact, the President’s Home, built in 1939, is a monument to WPA efforts. After lunch, we found a two-story bookstore called “Coldwater Books” in downtown Tuscumbia. The wood-paneled walls and tall tin ceilings created the ambience of a large library–unusual in a small southern town. I left a card listing my book titles for the manager to consider as the assistant manager said they promoted area writers from Tennessee (well, I reside at Sewanee a large part of the year)and Alabama. In the afternoon, after the deluge of the morning, I sat at my window on the fifth floor of the hotel watching the sun emerge and wondering if the weather would hold and allow me to reach the floor of the Dismals Canyon the following day. At that point in the pilgrimage, the Canyon’s name had certainly predicted the dismal weather! What did my mother think her legacy would be when, as a Golden Eaglet Girl Scout, she went on a primitive camping trip in Dismals Canyon, Alabama back in the 1920’s? Did she think that camp-outs would become her oeuvre? She surely didn’t know that someday her daughter, at age 74, would discover she was only three hours away from the Dismals and would make a pilgrimage to the place where she “rolled down the hill with a garter snake in her backpack every morning” – a story my mother Dorothy repeated endlessly because she was proud of having a reptile for a camp mate, of sleeping under a ledge in the Canyon and of surviving weeks of roughing it. She loved every moment of being in an environment that most people prefer viewing from a car window. It was her finest hour. The sight of badges sewn on every inch of the sleeves of my mother’s khaki Girl Scout uniform, Golden Eaglet pin included, used to taunt me. In the 80’s and 90’s, after she died, I worked as a Girl Scout executive and though I could recruit troops, figure out how to raise money for a Council, chart membership, and carry out corporate planning, I wasn’t the happy camper who lived out Juliette Low’s vision of a Girl Scout as the perfect nature girl – Dorothy was. I have come to Florence, Alabama to stay in a comfortable room on the fifth floor of a hotel where I can look out at the Tennessee River meandering through the city as I wait for the Dismals Canyon gates to open. I plan to drive over and hike a puny 1 ½ mile trail to the floor of the canyon to see why my mother talked about this outdoor experience as the high point of her life. It is raining steadily, and the Dismals won’t open for another day, so I begin an exploration of the city of Florence, now touted as the Renaissance City of Alabama and part of an area called The Shoals. We entered the city at noon on Wednesday and stopped at the $5 Buffet Restaurant where we were greeted by a cashier who explained why a large Mason jar of coins sat smack in the center of the cashier’s desk. A family needed money because a local Alabama man died in the hills of Tennessee, she told us. The man had gone to Tennessee to visit the grave site of a relative situated on a bluff, and while there, he and a companion became intoxicated and began throwing their empty beer cans off the bluff. They were unable to hear the cans hit the ground below, and the man whose relative was buried on the site, looked down, exclaiming, “Oh, that’s nothing…” and jumped. The jar on the cashier’s desk attested to his folly. Welcome to Florence, Alabama, I thought ruefully. However, at the hotel, I discovered a wonderful magazine, “Explore the Shoals” that featured stories of famous people who were born in the area, worked toward and realized formidable life goals, and I was inspired to explore the sites of: W. C. Handy, Father of the Blues; Helen Keller’s home in nearby Tuscumbia; the home Frank Lloyd Wright designed as an affordable, middle class residence in Florence during the 40’s; and an exhibit of WPA and CCC work at the TVA Museum of Art at Tuscumbia. Florence and environs offered enough to absorb me for several days until the Dismals opened. We toured the W.C. Handy birthplace, museum, and library where the personal papers, artifacts, personal trumpet and piano of Handy are housed. Newspaper clippings told the story about his classic composition, “The Memphis Blues,” the first popular blues music to include a “jazz break.” At one point in Handy’s life, he’s said to have been destitute; his bed being the levee of cobblestone in St. Louis, Missouri. Here, he heard a fellow indigent say: “I hate to see that evening sun go down,” and set to work writing the famous “St. 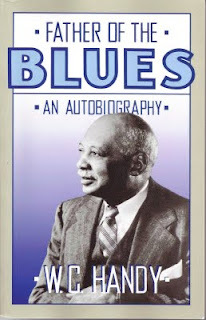 Louis Blues.” During Handy’s lifetime, he wrote 150 secular and sacred compositions. The son and grandson of ministers, W. C. Handy became a musician over his father’s protests – “a devlish calling,” his father said, but his son persisted, combining spirituals and black chants to form his famous blues music and also forming his own music publishing company in New York City, operating the business even after he became blind. Undaunted, he learned Braille in his 80’s so that he could still read music compositions. The visit to this site reminded me of a tour we once made of a blues museum in Clarksdale, Mississippi, one of the places where Handy lived and played the blues during his lifetime. In the Clarksdale museum, I remember seeing a wire stretched between two nails in a plank of wood. The crude instrument was used by a music-loving black man who somehow carried out a tune that would later become part of the sounds of the Delta blues. I spent a few hours reading Handy’s autobiography and found this arresting paragraph in the first chapter: “My father, Charles B. Handy, had been pastor of a charge at Guntersville, a small Alabama town, where he met a local banker who, on a trip to Nashville, was impressed by many colored people of wealth and culture…Father explained to this banker that ‘in a community of cultured white folk, there will be found a similar group of colored people, but in any place where backward whites predominate, there will always be found a group of backward and uncultured colored people.’” Those are Handy’s words, and his father would probably be labeled as “politically incorrect” today because of that opinion. Part II. and III. will appear in subsequent blogs. Every year, my sister-in-law Lori sends me pictures of the garden my brother Paul plants and tends in northern California. Paul has a “plus-green” thumb, and the gardens he creates are paradisiacal sites designed to inspire serenity in those who visit. 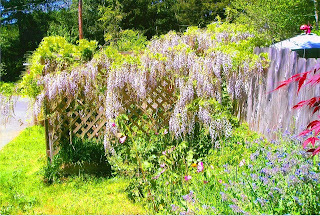 One of the plants of which Paul is particularly fond is wisteria, the woody climbing vine with violet and purple blossoms. I know that Paul must have memories of this climbing vine that formed a bower over a small bridge my Grandfather Paul constructed in the side yard bordering the old Greenlaw home in Franklinton, Louisiana. It was planted not far from a tall pear tree that arched over a free-standing swing enjoyed by grandchildren who wanted to “go up in the air so blue” (A CHILD’S GARDEN OF VERSE). The entire side yard was our playground when we made summer-long visits to Franklinton, a sleepy town of about 2,000 people. However, most of the time we steered clear of the wisteria vine because it hummed with giant bumble bees, one of which once attacked me when I buried my face in the heavily-scented blossoms. 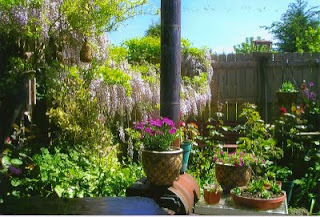 In California, one of Paul’s wisteria vines climbs a wooden lattice; the other seems to have a life of its own overlooking a barbecue pit that is being used as a stand for flower pots. The entire yard is a profusion of color and arrangement of orange nasturtiums, red salvia, petunias, and hollyhocks spilling over stones and placed among pieces of driftwood Paul collected from the nearby beach on the Pacific Ocean. It’s a place of small nooks and wooden bridges – oriental, yet very original in design. The back porch runs the length of the house, and a nook just outside the back door holds a hot tub. Bird baths nestle in clumps of elephant ears and fern; begonias bloom in wooden tubs. The stone and cedar house with a bay window in front is surrounded by a forest of cedar and redwood trees. When I first saw Paul’s garden, I exclaimed: “An artist lives here.”(Actually, he is an artist.) The entire site reflects a soul at work. I’ve read that the world’s largest wisteria vine has been discovered in Sierra Madre, California and that it’s more than an acre in size and weighs 250 tons! Some varieties of wisteria are edible, and others can be used for wine-making, but, even further, some varieties are toxic. I know that Paul’s vines are purely ornamental and grow well in that moist, northern California climate, thriving despite many gray days of partial shade. I’ve visited the site twice in the past 15 years and was amazed at the wonderful wisteria vines – at the overwhelming beauty and design of Paul’s garden and yard. When I told Paul that he had my father’s green thumb, he replied: “I’m further along than that.” He’s right, of course – my father’s yard was awash with blooms, but Paul’s place is idyllic! Note: Photos were taken by Lori Marquart, Paul’s wife. Also, copies of Paul’s paintings are on the covers of at least half of my 21 books, particularly those published by Border Press, Sewanee, Tennessee. Sunday, my friend Vickie and I walked to the Barnes and Noble bookstore on the University of the South campus, and as we came out of the store, we met Suzanne Warner, a mutual friend who attends St. Mary’s of Sewanee. Suzanne, a tall, thin woman, 70 years old (who thinks and looks much younger), is a former attorney who worked in the office of Attorney General Janet Reno during Clinton’s presidency. Suzanne’s working toward her M.Div. from the seminary here and, ultimately, toward the priesthood. She drives around in a sky blue 2003 VW convertible and gave us a “top down” ride back to our cottage, a ride that left me exhilarated from “taking the air” as the Cajuns say. We invited Suzanne in for tea and biscotti and spent an intense hour talking theology, mostly about the sacrament of reconciliation which may form part of Suzanne’s thesis. During the conversation, she mentioned an article entitled “Radical Ecumenism: A Teaching Moment for Anglicanism,” in the Pentecost 2008 issue of “Sewanee Theological Review.” The thoughts that piqued my interest in the article concerned the Amish example of Christian living and our need to hear the testimony of Anabaptism. The first year we lived here at Sewanee, we traveled over to Ethridge, TN., a small town nestled deep in Amish country where a group of Anabaptists live and farm. We visited a mall of beautifully-crafted Amish furniture and bypassed the buggy rides being offered near the restaurant where we ate lunch. After lunch, we drove deeper into the countryside where farms appeared on most every hill. Children ran barefoot in the dusty yards beside corn fields that had been parched by the drought of that summer, and roadside stands advertised jams, jellies, soaps, fresh corn, and tomatoes. We stopped at a weathered farmhouse with a wide porch that covered the front and one side of the house. A young girl, barefoot and dressed in a long blue dress, slowly swept away some of the road dust. She smiled at us and stopped sweeping but was admonished, in German, by her mother who came around the side of the house to see if her charge was still at work. A young boy manned the crudely-built roadside stand and sold us a jar of jelly, a bar of odorless soap, and a few ears of corn. He averted his eyes and spoke only to give us the cost of each item. I admit that I stopped at the farm out of curiosity and didn’t give much thought to the religious views of this sect of Anabaptists. To me, these people with no running water, transportation, electricity, TV, radio, telephone, computer, seemed to be living in a time warp. Those in other denominations who read this article will very likely pause and reflect on their own Christian faith and practice. One of the most important points Hein makes about the Anabaptists, or the Amish, is that they practice “Nachfolge Christi”: following Jesus daily – a pattern of discipleship that involves obedience to the way of Christ and expresses love for their Christian community. Hein’s explications about the Amish resonated with me, particularly the revelation that Amish don’t pay attention to the assurance of salvation and emphasize the conscience and the will. He quotes John Hostetler (Amish Society) “Christ becomes a Wegweiser, one who shows the way, and not merely one who has atoned for the sins of mankind.” Amen. Well, Suzanne dropped a plum in my lap, and incited in me some heavy reflecting about the Amish community that I sorta’ passed through without giving much thought to their way of life and their faith, a group of people who, as Hein said, “challenge many of the values the rest of us hold dear” with their ideas of self-denial, humility, and forbearance. There’s certainly something highly exemplary in an acronym posted in Amish schools: “JOY,” which means Jesus first, Others next, Yourself last. There aren’t too many of us who would have acted as the thirteen year old girl named Marian did in the Nickel Mines tragedy when she realized that the man who had invaded the Amish classroom intended to kill the children. She asked the man to shoot her first, just to buy some time for the others. She had imbedded that acronym, JOY, in her heart and acted out of a heartfelt wish to take care of the threatened children. I first met Lisa Graley about eight years ago when Dr. Mary Ann Wilson, professor of English at ULL, introduced her to me (Note: Mary Ann’s essay about Grace King in LOUISIANA WOMEN was highlighted in a recent blog). Lisa, a soft-spoken woman with blushing complexion impressed me as a gentle person who possesses unusual grace and empathy. When I read the first story she published in “Glimmer Train,” those qualities of her character became more apparent in her prose. This woman, I thought, has an authentic voice. The voice comes out of West Virginia, Lisa’s birthplace, and has deep roots in the Appalachian Mountains. Just recently, a second story by her, which appears in “Glimmer Train,” establishes her as a writer of place, one of those gifted people who make particular regions in the country come alive in fresh, highly accessible prose – prose that is often playful when the author uses folk metaphors indigenous to the region about which she's writing. Lisa was born in Sod, West Virginia, the name itself speaking of farmers, cattle growers – hill folk inured to the soil. In her latest story, “Vandalism,” the reader will find small carats of sagacity that emerge from a tradition of southern storytelling and that convey an innate wisdom characteristic of hill folk. I’m not going to reveal the story because I’d like to encourage readers to order copies of the handsome magazine in which Lisa’s story appears and to read the story for themselves, but I did want to excerpt a few of the “carats” I mentioned above to titillate the reader. 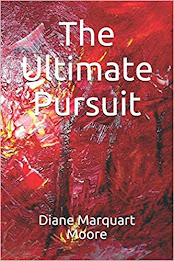 I might add that the story carries a strong theme of redemption and forgiveness that reflects Lisa’s personal religious upbringing, a subtle theme woven into the story without mawkishness or judgment. Lisa was awarded a grant to pursue her creative writing this year and is presently on sabbatical from ULL. She says she spends most of each day working on a collection of short stories she plans to complete by the time her sabbatical ends. She also carpenters and continually makes improvements to her home in Lafayette, which she renovated several years ago. To provoke (or invoke) the Muse, she runs almost daily. “Glimmer Train” is a notable literary press established by two sisters who studied language and linguistics in college, and the idea for becoming publishers was conceived over pizza and beer. Their press has been in existence for 18 years, and they report that for years they read paper submissions, receiving as many as eight buckets of submissions, or 250 pounds of mail, daily. This inundation of mail made reading of every submission impossible, and the sisters had to employ other readers. However, with the advent of online submissions, their system of reading has been made easier, and they’re now able to read every submission without additional readers. Since 1990, the sisters have read thousands of stories and tout that they enjoy focusing on their first love: READING. Since they’ve accepted two of Lisa’s stories, it’s obvious that they recognize she has an authentic literary voice. 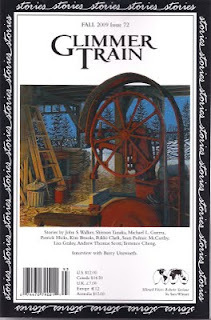 The picture above is the cover of “Glimmer Train,” Fall 2009, Issue 72, in which Lisa’s story, “Vandalism” appears. You’ll also enjoy a photo of Lisa and her brother on the page facing her story, as well as comments in the end pages about a West Virginia woman who encouraged Lisa to write. You can go online and click on “Glimmer Train Press Store” to order this issue and a back issue that features Lisa’s work. You’ll find a handsome magazine filled with outstanding stories… especially those penned by my friend, Lisa Graley. Seated before the altar, eight nuns claim their lofty perch on the bluff at St. Mary’s. They are dressed in blue jumpers and white blouses, the uniforms of school girls, and most of them traveled over dry land to reach this bluff sanctuary. Their journey to a spiritual home differs markedly from the journey of the Ursuline nuns who, in 1726, were struck by a vision: education for Louisiana women. 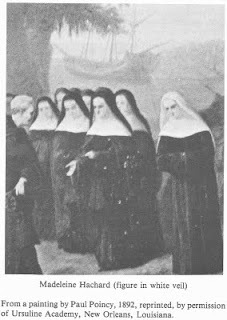 Nine nuns and two postulants boarded La Gironde in Rouen, France and sailed five months on the rocky ocean, bound for New Orleans and the New World. At one point, they threw sheep, chickens, and luggage filled with their habits into the sea, lightening the load to avoid sinking. Marauding pirates threatened La Gironde, but the marauders were unable to pass through the nuns’ wall of prayer. At Dauphin Island, La Gironde ran aground, sinking into five feet of sand and muck. The vessel soon dislodged, still carrying its human cargo, but ran aground again and finally anchored at La Belize. The nuns disembarked, black skirts billowing, and were forced into narrow pirogues where they sat atop mattresses and chests, slowly covering the thirty leagues up the Mississippi River to their destiny. They stopped before sunset each day to avoid swarming maringouins (mosquitoes) and were awakened by hard rain, their mattresses afloat, their habits drenched. The nuns’ faces and legs swelled with colds and rheumatism, but they moved on. Intrepid as the women were, they shuddered at the sight of snakes, scorpions, and crocodiles teeming in the swamps. For nine days, the Ursulines paddled upriver to New Orleans, searching for a green-shuttered convent with thin cloth on the windows – windows that allowed enough light to illuminate their vision of the new school. It was soon filled with boarders – slave women, orphan girls, and abused women seeking protection and learning. The Ursuline Academy, a white stucco building with cypress beams and handmade brick walls, became a beacon of learning, one of the first institutions of learning for Louisiana women in the 18th century. When I travel back and forth from New Iberia, Louisiana, my winter residence, to Sewanee, Tennessee, my spring and summer residence, the bulk of my baggage consists of boxes of manuscripts and personal papers which fill the backseat and floor of the car. Each time I prepare for the trip, I begin culling papers, and my “finds” are often quirky pieces of paper; e.g., an unpublished profile of my great-grandmother Dora Runnels Greenlaw, scraps of poems never finished, a ten-page resume that I prepared before taking a job on the executive staff of Bayou Girl Scout Council, and, yesterday, I discovered the silhouette shown above that was drawn by my mother. The silhouette appears to have been torn from a scrapbook, three of which I inherited after she died. The scrapbooks are filled with whimsical pictures she drew during her college days at Mississippi Woman’s College (now defunct) and Mississippi State College for Women. She was forced to attend both colleges because my grandfather Paul was attempting to keep her separated from her childhood sweetheart and marriage. At these two institutions, Dorothy majored in Art, and she must have spent a lot of time filling those scrapbooks, which often makes me wonder about her devotion to academic interests. Never mind, I understand the creative bent, and each time I discover an old picture or drawing she rendered, I’m grateful that she encouraged all of her offspring to “follow their bliss,” to nourish the artist within – through painting, writing, woodworking. Dorothy grew up in the early 1900’s at a time when “shadow pictures” were popular, and I know that she rendered far more “shades profiles” than I have unearthed. These silhouettes are outlines of people with interiors that are featureless and were done in black like the one above. During Dorothy’s era, they were usually drawn and not cut out. However, in the 18th century, the representations or portraits were cut from thin black cards. The word “silhouette” is derived from the name of an 18th century French finance minister who enjoyed creating cut paper portraits. Today, silhouette portraits can be painted or drawn or cut out from lightweight black cardboard and mounted on a white background. Some specialist artists are able to sketch and cut out the likeness of a person within minutes, but I know that Dorothy labored longer over her shadow pictures. Most readers will recall having seen silhouettes of famous people like Beethoven or Jane Austen, or even the images of human evolution. The picture shown above is probably a sketch of one of the three oldest children in my family sitting in a high chair, trying to learn how to self-feed, while one of Dorothy’s numerous cats watches for a crumb to be dropped. The rendering may be a simple copy of a Gerber baby because one of her scrapbooks contains hundreds of pictures of these babies she found in magazines of the day. She cut them out and studied their features, I think, so she could learn how to make shades profiles. Today, silhouettes are again popular, particularly in the decorative arts industry and are being used on wallpaper and stationery, even pants cuffs. Practically speaking, they’re used for traffic signs, for military use, and as target pictures for those who’re interested in outdoor shooting practice(!). I’m sorry that Dorothy didn’t live to see the resurgence of an art she loved, but I’m glad I have the keepsake above to remind me of her interest in all things artistic and to stoke my own creativity when I feel that the muse has left me high and dry. Yesterday afternoon, one of my closest friends in New Iberia called me, and when I answered, she almost shouted, “Just don’t even come home; just don’t even bother to come back here to New Iberia (my winter home).” I couldn’t imagine how I had offended her since I’m here on The Mountain, and she’s there in Teche country. She went on to tell me about a sight that incensed her and that I wouldn’t want to see, describing the slaughter of old live oak trees on Darby Lane, a lane I travel to reach my home in New Iberia. In fact, my home is less than a mile from the sight of tree destruction. My friend was referring to the old oaks that have lined Darby Lane for several centuries and which are often destroyed by hurricanes. During the course of the conversation she quieted down, and I didn’t dare tell her that the entire lane had once been bordered by beautiful woodlands and an entire forest of trees had been cut to make the subdivision where our homes are located. 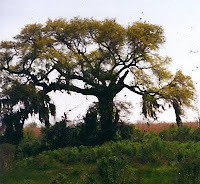 Actually, in the early history of the Attakapas District, which included Iberia Parish, there were once little forests called Salvador Islands or New Iberia islands, or by the Acadians, “Trois Isles.” Here, Spanish authorities gave some Spaniards permission to cut timber, and when these lands were sold after the Louisiana Purchase, the Spaniards continued to cut trees. Because titles to this land had never been issued, the Spaniards were sued and had to pay damages. So tree-cutting in the region has been going on for several centuries! Darby Lane is near the area where Malaguenos first settled in New Iberia and is also the site of a latter-day version of the old Darby House. The old Darby House was built on land granted by the Spanish government to Jean Baptiste St. Marc D’Arby during the early part of the 19th century. The D’Arby family lands were southeast of Spanish Lake, site of my YA novel, FLOOD ON THE RIO TECHE, and the story about the house titillated me when I was considering writing about the Spanish settlement of New Iberia. The home was built for Francois St. Marc Darby and is always referred to in New Iberia as the old Darby House. A Colonial style cottage, it was a two-story structure with a ground floor made of handmade brick and a second floor constructed of cypress boards. The lower floor was level with the ground, and steps led up to the upper gallery at the front of the home. Imposing stuccoed brick columns enhanced the handsome appearance of the front of the Darby House. The Darby family possessed great wealth and had a home in New Orleans, as well as Paris, and the children were sent to France to finishing school. According to Harnett Kane, the Darbys had an opera box in the Louisiana capitol and enjoyed dancing in St. Martinville, then known as “Le Petit Paris” of Louisiana. After the Civil War, the Darby family plantation failed, and the fortunes of the Darbys diminished. By 1897, Francois and Octave Darby owned the home, along with a sister, who isn’t named in historical records. Francois and Octave Darby quarreled and lived in the house together without speaking. It is said that when a cow that one brother owned broke into the green patches of the other’s designated yard space, the Darby who suffered the trespass of the cow sang a song about the incident to inform his brother, without engaging in conversation about the cow’s invasion. Then the sister quarreled with one brother and vowed to leave her possessions to the other brother. When she died, the brother to whom she had vowed to leave her possessions rushed to his attorney with a sealed envelope, and in it was a sheet of paper with nothing written on it! Octave died, and Francois lived on by himself. Those who ventured too near the property were threatened by the bearded old man running out of the house, bearing a hatchet. Beautiful furniture, covered with newspaper, molded, and holes appeared in the roof. The hermit Darby Home heir cooked his meals in fireplaces and ate them off cracked marble mantels. He lay down to sleep on straw in a corner of his bedroom. In the early 60’s when I first saw the ruins of the old house, the roof had been replaced with a rusting tin one, the gallery had been destroyed by a hurricane, and one part of it jutted into the air. A huge, drooping oak stood in an overgrown yard where pigs, chickens, even a pony wandered. One afternoon, I went with an artist friend and my daughter Stephanie to watch the friend paint a watercolor of the old house. Stephanie, then four years old, became restless, and my friend told her that if she’d be still awhile, she’d let her ride the pony grazing in the yard after she finished the painting. She finished the watercolor, a beautiful rendering of the ruined home, and took Stephanie by the hand to give her a ride. As my friend was an expert horsewoman, I trusted her to know what to do. However, when she put Stephanie on the pony’s back, it reared and Stephanie was thrown clear, but my friend received a swift kick in the lower abdomen. I drove her to the hospital where the doctor found no broken bones, but she was severely bruised. Perhaps Francois’s ghost was still hovering around the property, protecting it from invasion by strangers! In the 70’s, Al Landry, a New Iberia architect, applied for a grant to restore the old home as a historic property, and the week he received approval to renovate the Darby House, it mysteriously burned to the ground during a hard rain. Again, was Francois’s ghost hovering around the property?! I was tempted to drop the project of FLOOD ON THE RIO TECHE last year and to tell, instead, the story of the old Darby House. However I opted for the story about the Spanish settlement of New Iberia and decided against further disturbing the irascible Francois Darby. Today, a replica of the home stands on the original Darby Home site, ancient oaks keeping watch over the property, and, as I told my friend, at least those trees on the old Darby property won’t be cut down. Some remnant of history remains, and if the lordly trees could talk, we'd hear some interesting stories – perhaps about the good times in the old Darby House, pre-Civil War, rather than those tragic tales historians have recorded.